Gentlemen Prefer Blondes is a jazz-age classic with a modern-day twist. Originally published in 1925, the same year as F. Scott Fitzgerald’s the Great Gatsby, the jazz-age novel par excellence, it is a satiric novel told in the form of a diary kept by its main character, Lorelei Lee, a gold-digging flapper from Little Rock. 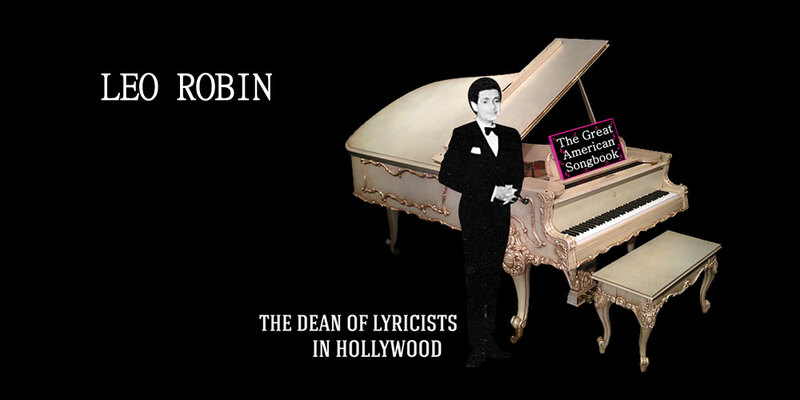 The 1949 Broadway musical of the same name is the result of a collaboration, twenty-four years later, between original novelist, Anita Loos, and veteran playwright, Joseph Fields, joining forces with composer Julie Styne and his seductive, upbeat score along with the dazzling witty lyrics of Leo Robin. When the show first opened, little-known Carol Channing, in the lead role, shot to stardom as she belted out her wide-eyed brassy show-stopping anthem, “Diamonds Are a Girl’s Best Friend.” Marilyn Monroe, in turn, who reprised the role in the 1953 movie version, was herself catapulted to immediate superstardom by her own breathy, alluring tease of an interpretation. 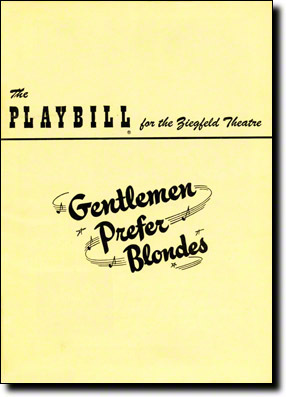 The original production of Gentlemen Prefer Blondes, directed by John C. Wilson and choreographed by Agnes de Mille, opened on Broadway at the Ziegfeld Theatre on December 8, 1949. It ran for a grand total of 740 performances. 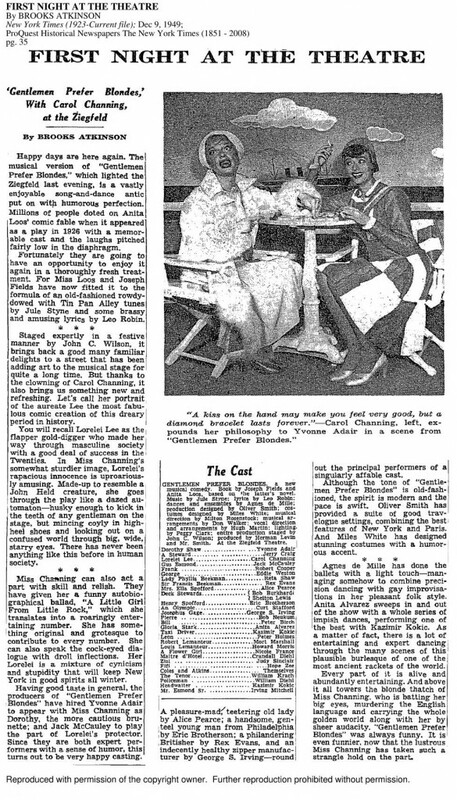 A review of the opening night, provided below, First Night at the Theatre, by Brooks Atkinson, that appeared in the New York Times on December 9, 1949, provides a synopsis and other interesting details about the show. Please note that applying for a show license for Gentlemen Prefer Blondes does not guarantee that the show will be available. Restrictions may apply. If you would like more information on licensing and/or to request a license for Gentlemen Prefer Blondes for a theatrical show, presentation or concert performance, please contact Tams-Witmark Music Library or click on this link: Tams-Witmark Music Library.